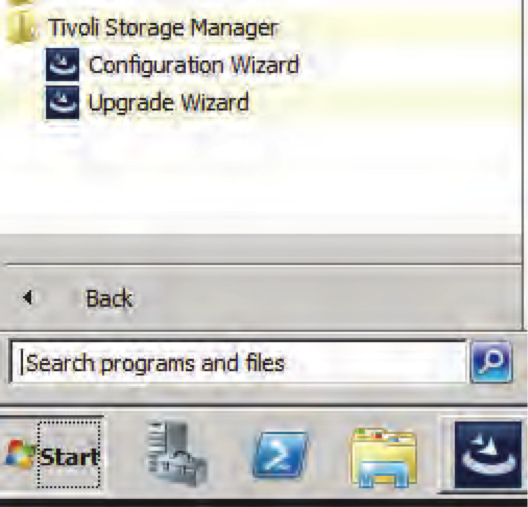 You can install Tivoli Storage Manager V7.1 or higher by using the graphical user interface (GUI), the console wizard, or while in silent mode, with or without a response option. Tivoli Storage Manager’s version of the DB2 database and logs are installed along with the server. You cannot install and run Tivoli Storage Manager 7.1 server on a Windows system that already has DB2 installed on it, whether DB2 is installed by itself or as part of some other application. The Tivoli Storage Manager 7.1 server requires the installation and use of the DB2 version that is packaged with the Tivoli Storage Manager 7.1 server. No other version of DB2 can exist on the system. This is not a limitation with UNIX or Linux. Installing IBM Tivoli Storage Manager V7.1 is a two step process. In the first step you have to install TSM Server components and in the second step you have to configure the TSM Server instance, Database and recovery log. TSM V6.X and TSM V7.X installing follows the same procedure except the first step. In TSM V7.X, we have to install TSM V7.1 server components through a new interface called IBM Install Manager. And the second step is common in both the versions as shown in the below video. It is not recommended to install TSM Server and Storage Agent on same machine. Step 1: Log on as an administrator and go to the directory where TSM Server V7.1 code is located. On AIX, Log in as the root user. If you do not log in as root, certain key Tivoli Storage Manager functions do not work properly. ON AIX, Change file permissions by entering the following command and then extract the package. Step 2: On Windows, Double click the install package to extract the package. It will take some time for extraction. This will open up the installation manager window as shown in the below screen, you need to select the components which you want to install. You have to use the installation manager interface for any future up-gradation or any new installation. On AIX, Go to the directory where you have extracted the packages and run the install.bin file. Check the following link for installing TSM server components in AIX in console mode. 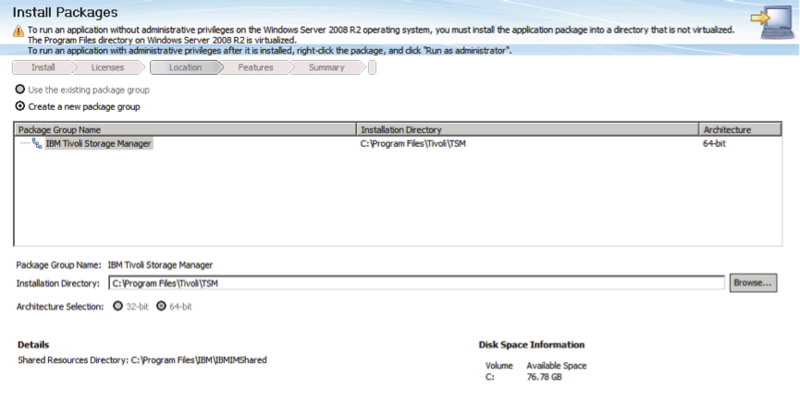 Next, select the shared resource location for IBM Installation Manager. Next, select or choose the default location for TSM components installation. The default location for Windows is C:\Program Files\Tivoli\TSM. The default location for UNIX and Linux is /opt/tivoli/tsm/. Step 3: In the next screens, you need to accept the license agreement, select languages and other options as shown in the video. If you encounter any problems with the installation, directions refer you to the appropriate log files. The log for a new Windows server installation is the directory that is chosen for installation, look for the files log.txt and logs.zip. The log for a new AIX server installation is /var/tivoli/tsm. Step 4: After the successful Installation, In both Windows & Unix, you should create the Directories and user ID for the server instance, which the Tivoli Storage Manager server instance needs for database and recovery logs. Create the following directories with the instance user id you created for TSM Server instance. It is always recommended to use the tsm server instance user id to start the TSM Service on any platform. The Instance directory contains files for this server instance. The instance directory will include all Tivoli Storage Manager server files, such as the server options file (dsmserv.opt), the device configuration file (devconfig), and volume history file (volhist). Recovery log directories: Active log, Archive log, Active log mirror (optional), Archive failover log (optional). Step 5: After the successfull installation of TSM V7.1 server components, we have to configure the server instance and database. In the following video I used administrator id for configuration but it is recommended to use userid which you created in the previous step for server instance configuration. This way you can keep TSM server from unauthorised user access. Now, Start the configuration wizard from the installation directory. or you can open it from the START menu in windows as shown below. On AIX, check the link to know how to configure TSM Server instance and database using dsmicfgx with screenshots. Now, follow the steps as shown in the below video to configure the TSM V7.1 server instance, database and logs. Same procedure for TSM V6 and TSMV7. For Windows: dsmserv –k server_key where server_key specifies the name of the Windows registry key where you retrieve information about the server. The default is Server1. For AIX and Linux: dsmserv –u instance_dir where instance_dir specifies an instance directory to use. This instance directory becomes the current working directory of the server. If necessary, you can stop the server by issuing the halt command from the Tivoli Storage Manager administrative command line. 1) Use the new instance wizard on your local system (dsmicfgx.exe). 2) Manually configure the new instance. Create a new server option, Copy the dsmserv.opt.smp sample file in the installation server directory to set up communications between client and server. Rename the copy to dsmserv.opt. Do this before you start the server for the first time. Define database and recovery log, Issue the dsmserv format command to initialize the database and recovery log. Start the server, Issue the dsmserv command. For example, to install an additional server, set up an instance directory, and issue the DSMSERV FORMAT command with the -k (Windows) or -i (UNIX and Linux) parameter from that directory. That directory becomes the location of the server. The registry tracks the installed servers. Start theInstallation Manager. On Windows, Open the Installation manager from the Start menu.On UNIX, In the directory where the Installation Manager is installed, go to the eclipse subdirectory (for example, /opt/IBM/InstallationManager/eclipse), and issue the ./IBMIM command. Select IBM Tivoli Storage Manager server, and click Next. You cannot uninstall only one component of Tivoli Storage Manager. If you uninstall the server, all other components you previously installed are also removed. The uninstaller also cleans up the registry; however, you must clean out the temp directory. 5 Responses to "2.1 Tivoli Storage Manager Server Installation and Configuration steps"
Can you help to know the exact link to get the software to download on unix box. Have you guys got Error 449 while formatting database?